Render repair, which can include plaster repair, is carried out due to damage caused by movement (wall cracks, hollow render patches), dampness (salt penetration, efflorescing salts) and weathering (stress cracks, caused by temperature changes.) 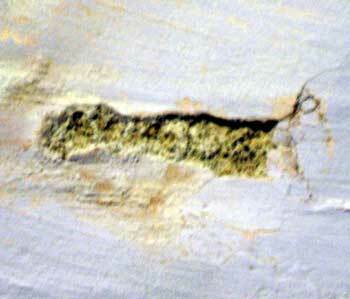 You can repair walls, deal with render problems and repair plaster using our epoxy repair products. Please call for free technical advice. 1. 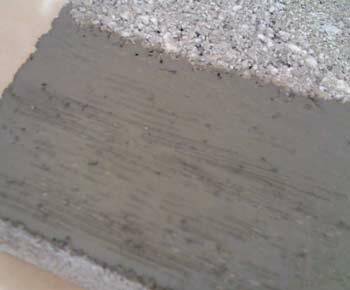 Grind or chisel out - cut into the cracks to produce square sided slots to the full depth of the render coatings..
2. Clean - remove all dust by brush, vacuum or compressed air. 3. Prime - apply one coat of Epoxy Primer. 4. Fill - whilst the Primer is still tacky apply Moldable Epoxy Putty. Smooth with a wet knife. 1. 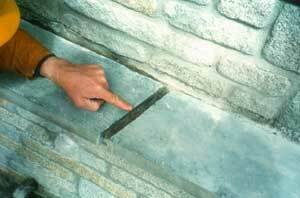 Cut out - cut out patches well clear of the damaged or cracked edges with a masonry grinder to form square edged slots. 2. Remove all dust and debris by brush, vacuum or compressed air. 4. Fill - whilst the Primer is still tacky apply Epoxy Patching Mortar. Smooth with a wet knife. 3. Wet out with fresh water and prime with BondAcryl. 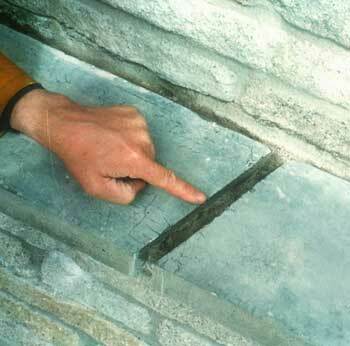 How to choose a crack repair method and material in brick, stone, render and concrete. 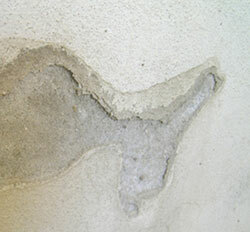 Apply Epoxy Primer liquid by brush and whilst tacky lay in the putty-like repair mortar, Moldable Epoxy Putty. Moldable Epoxy Putty - available in 500cc and 1 litre, two pot, putties. Slot correctly cut out, square shouldered, dust blown out, ready to Prime and Fill. Mixing. You can add your own Site dust or chippings to the surface, (or ask for our Mortar Colour Powder), which you can mix into Moldable Epoxy Putty, used as a surfacing finish. 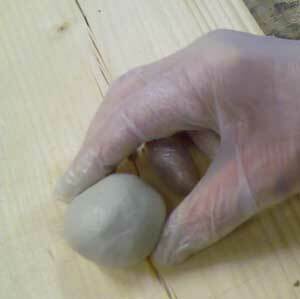 Moldable Epoxy Putty - available in 500cc and 1 litre, two pot, putties..
Mixing Moldable Epoxy Putty in the gloved hand. 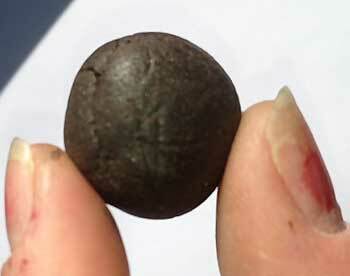 To refinish damaged render, or to seal a 'bund' (to retain chemicals, oils etc.) apply two coats. 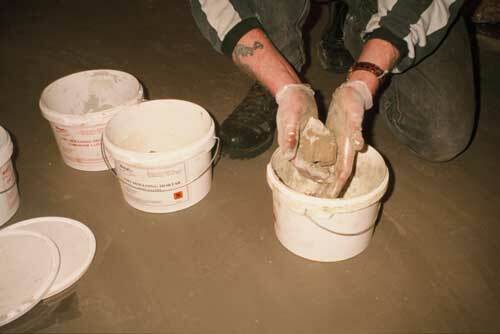 Cement Based - Hydradry cementitious 'tanking' coating is a waterproof barrier suitable for indoor and outdoor use. The cement based system is easy to apply to damp and rough surfaces, requires two coats brushed out in different directions (to avoid pin holes) and is rapid drying. BondAcryl - available in 1.5, 5 and 25 litre plastic containers, add OPC (cement). To treat delamination or hollowness, drill a 5mm - 10mm diameter hole into the crack every 100mm to the depth of the separation between layers (hollow area). Inject Epoxy Primer/Consolidator, a thin liquid, or Thixotropic Injection Resin , a gel type product, until it exudes from the next hole. Test for hollowness with a plastic hammer until the delaminated areas cease to sound hollow. Injecting cracks in masonry using a syringe. Syringes - in 10cc, 20cc and 50cc sizes. Thixotropic Epoxy Injection Resin - available in 400cc, two pot, gels, with cartridge kit.